When you start to become proficient with the basics of Photoshop you may want to blend layers and add one image onto another. If the surface of the base is flat and two-dimensional this is easy. But when the surface is 3d laying a flat 2D image on top can look unnatural. Here's a technique to make the top layer mold to the shape of the bottom. When you master this you'll be able to body paint, human and mechanical, add posters to corrugated iron like this or walls and create all sorts of wonderful montages. In the tutorial we will select a suitable photo, copy it and make a displacement map, select another shot to use as a poster, add this as a new layer, distort it to make the perspective look correct using the transform tool and then apply a displacement map and blend using blend modes so it looks realistically placed. 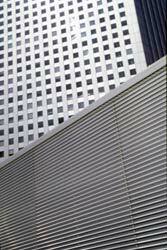 The image I've picked is a modern office building shot from a low angle. In the foreground is a corrugated fence. 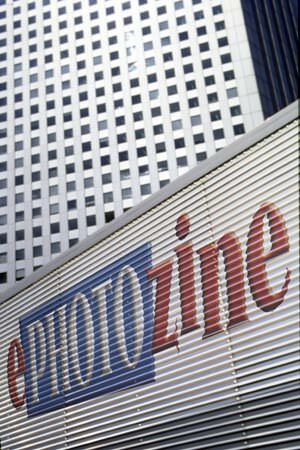 I'm going to place an ePHOTOzine logo on the fence so it looks like an advertising board and the logo will take on the contours of the corrugated metal thanks to Photoshop's displacement filter. 1 With the main photo open make a duplicate: Image>Duplicate. A dialogue box will appear asking you to name the duplicate photo. It will have the original file name with 'copy' at the end. Change the word copy to displace so you can recognise the file. Click okay and the duplicate image appears active above the original. This new image is now going to be adjusted in tone so that it makes a suitable displacement map. 2 If you are using an RGB file remove the colour from the duplicate file using the desaturate option: Image>Adjustments>Desaturate (Ctrl Shft U). 3 Now select the Levels option: Image>Adjustments>Levels (Ctrl L) and drag the left and right sliders inwards so that the tones are compressed making the photo look contrasty with hard black and white tones and fewer grey tones. 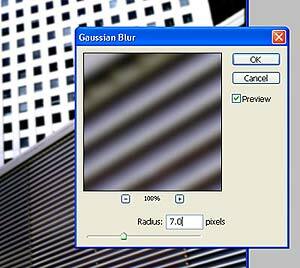 4 Blur the photo using Filter>Blur>Gaussian Blur and set a suitable radius. I've set 7.0 for this, but the value depends on the size of the photo and the detail. Somewhere between 5 and 20 is usually about right. 5 This now looks like an unusable photo, but when you save it as a PSD file it can be used by the displace filter to map out the contours for your new layer, as we'll see soon. Save the file File>Save (Ctrl S) making sure the format selected is Photoshop .psd and that you save it in a suitable easy to access place. And close it. TIP I always create a folder when working on a new image or project and save any relevant material in that one folder. 6 Now go back to your original image and open the new image that you intend to paste onto the existing one. 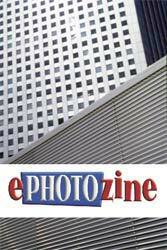 In this case I will use the ePHOTOzine logo and paste it onto the corrugated iron wall. So I open the logo copy (Ctrl C) and Paste (Ctrl V) to the original. It will appear in the middle. 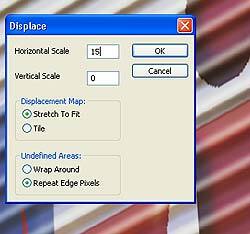 7 Use the move tool to position it over the corrugated area and then Edit>Transform>Distort to make adjust the perspective. Here I want the logo to appear as though it's following the direction of the wall so the left side will be thinner than the right and the whole thing will slope down so the logo top and bottom is parallel with the slats of iron. The distort tool puts a set of handles around the frame that can be dragged to reshape the current rectangle frame so it can be transformed into the necessary shape. 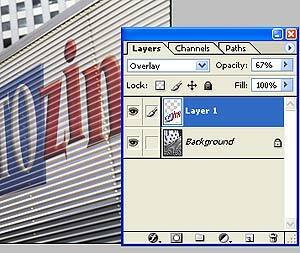 Reduce the logo layer's opacity to about 50% if you want to see what's underneath to help you obtain the best position. 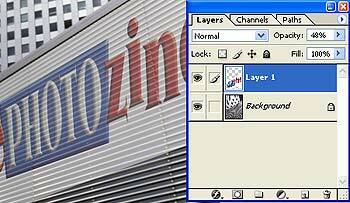 8 Once the logo is adjusted to the correct size and perspective, change the blend mode. The blend mode you choose will depend on the two layers you are blending. Best thing to do is to click on Normal and then use your up and down keys to scroll through the list watching the preview as you do. I chose Overlay and reduced the opacity to 67% which gives a satisfactory result. 9 Now it's time to apply the displace filter. It's a good idea to magnify the photo so you can see what effect the displace has. Go to Filter>Distort>Displace and a dialogue box appears. In here set the Horizontal scale to between 10 and 15, again depending on the size of your photo. The higher the number the greater the distortion. When you click okay you will be asked to find a displacement map and it's now when you recall the duplicate .psd image you made earlier. I set 15 first (left) and found that was too severe. 10 was a more realistic option (right). If the result doesn't look right you can go back to step 3 and try different settings to the levels and then in step 4 change the strength of the blur. That's all there is to it. In this technique you can use the displace feature to layer items successfully on any material. Popular options are waving flags, creased clothing, brick walls and such like. And with your new skills the blends will appear much more realistic.